DETROIT, Mich. (July 2018) – Living Arts, a Detroit nonprofit that brings high quality and year-round arts education to the city’s youth, is proud to announce it has received several multi-year grants totaling over a half million dollars to support the expansion of Detroit Wolf Trap, a program that will provide intensive professional development, mentoring and coaching for Detroit area early childhood educators, parents, and caregivers by introducing them to proven performing arts-integration strategies through classroom residences and professional development workshops. Teaching Artist Alesha Mickens uses music to engage young learners in a Living Arts' Detroit Wolf Trap Class. Photo by Julianne Lindsey. “This generous partnership will amplify and deepen Detroit Wolf Trap’s proven impact on teachers, parents, and students in classrooms and homes across Detroit, by elevating the role and effectiveness of educators and caregivers in supporting the early education of our region's youngest children,” said Alissa Novoselick, executive director of Living Arts. “It is exciting to know that these organizations are working collectively to ensure that not only the children but the adults engaged through Detroit Wolf Trap programming will meet achievable goals to continue best practice for early learning through the arts,” added Roberta Lucas, master teaching artist and Detroit Wolf Trap’s founding director. The contributing organizations -- Community Foundation for Southeast Michigan, Fred A. and Barbara M. Erb Foundation, Kresge Foundation, and W.K. Kellogg Foundation -- will provide long-term classroom residences for children ages 3 months to Kindergarten. Additionally, the W.K. 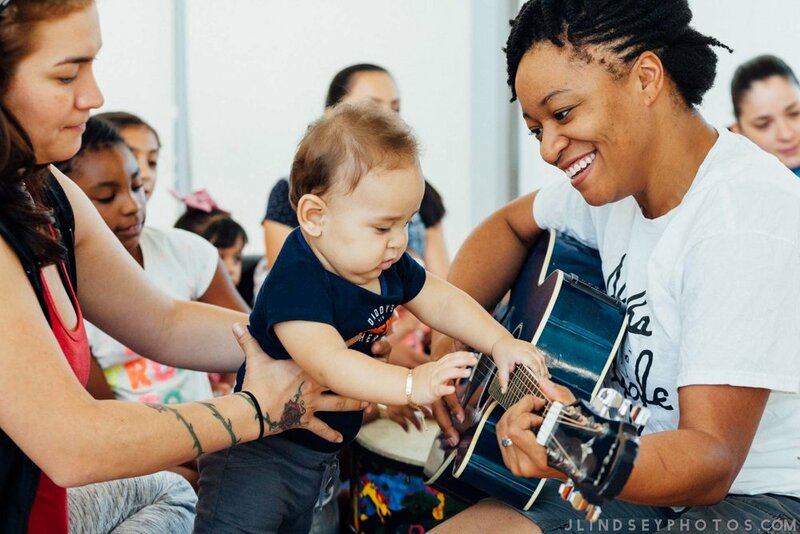 Kellogg Foundation’s award will enable Living Arts to expand evaluation efforts to demonstrate the positive impact Detroit Wolf Trap has on the teaching practices of early childhood educators in Detroit. Living Arts’ Wolf Trap program, an affiliate of the national Wolf Trap Institute for Early Learning Through the Arts, has proven to strengthen children’s literacy, math, science and social emotional skills in its first phase of evaluation, completed in 2017. The Community Foundation for Southeast Michigan is a full-service philanthropic organization leading the way to positive change in our region. As a permanent community endowment built by gifts from thousands of individuals and organizations, the Foundation supports a wide variety of activities benefiting education, arts and culture, health, human services, community development, and civic affairs. Since its inception, the Foundation has distributed more than $1 billion through nearly 65,000 grants to nonprofit organizations throughout Wayne, Oakland, Macomb, Monroe, Washtenaw, St. Clair, and Livingston counties. For more information, please visit www.cfsem.org. The Fred A. and Barbara M. Erb Foundation’s mission is nurturing environmentally healthy and culturally vibrant communities in metro Detroit, consistent with sustainable business models, and supporting initiatives to restore the Great Lakes Ecosystem. Established in 2007, the foundation funds grant applications that benefit the environment, arts, and Alzheimer’s research. The Kresge Foundation was founded in 1924 to promote human progress. Today, Kresge fulfills that mission by building and strengthening pathways to opportunity for low-income people in America’s cities, seeking to dismantle structural and systemic barriers to equality and justice. Using a full array of grant, loan, and other investment tools, Kresge invests more than $160 million annually to foster economic and social change. Kresge’s Detroit Program collaborates with civic, nonprofit and business partners to promote and expand long-term, equitable opportunity in Kresge’s hometown for its current and future residents. For more information visit kresge.org. Founded in 1999, Living Arts is a nonprofit organization that engages Detroit youth, teachers and families in transformative experiences in the performing, visual, literary and media arts. Implementing arts education programs for nearly 3,000 early learners, elementary and secondary students annually, Living Arts’ programs increase youth’s academic achievement, develops leadership and artistic skills, and strengthens schools and communities. Living Arts receives support from the Ford Motor Company Fund, Max M. and Marjorie S. Fisher Foundation, Community Foundation for Southeast Michigan, Dresner Foundation, The Kresge Foundation, Fred A. and Barbara M. Erb Foundation, W. K. Kellogg Foundation, Michigan Council for Arts and Cultural Affairs, ITC, and PNC Foundation.